Many researchers have found that investment strategies based on value can work in the long run. The researchers have published results using various metrics, including the price to earnings (P/E) ratio, price to book (P/B) ratio and other fundamental ratios. Papers on this topic generally follow a similar procedure. The researchers sort all stocks by the metric being studies, the P/E ratio for example. They then create a portfolio that simulates owning the most undervalued stocks, or the ones with the lowest P/E ratio in this example. The researchers also generally create a second portfolio of the most overvalued stocks, which would be the ones with the highest P/E ratios. These stocks will be grouped in a portfolio of stocks that are assumed to be sold short. When an investor sells a stock short, they are selling a stock they do not own. To complete the transaction, they borrow shares of the stock from their broker. This loan will eventually need to be repaid. To do that, the trader will buy the shares of the stock they sold earlier. The goal of a short trade is to profit from a decline in value. Since the stock is sold first, the trader makes money if they are eventually to buy the shares at a lower price. In the research papers on value, the researchers will usually report results showing the difference in performance in the two portfolios. Ideally, the undervalued stocks will rise in value and the overvalued stocks will decline in value. Many studies show this type of behavior. While researchers have found the strategy of shorting overvalued stocks can be profitable, there are several issues that individual investors should consider before shorting stocks. In fact, the mechanics of the trading process can occasionally make it impossible for individuals to profit from short positions. One problem is the cost of a short position. Traders have to complete these transactions in margin accounts and an adverse move in the position (which would be an increase in the value of the stock) could increase the margin requirement. This would generate a cost for interest on the margin loan. There is also a cost to borrow the stock. This varies from stock to stock and even from hour to hour. The cost to borrow is based on your brokers ability to borrow the shares. This cost can be as little as a few percentage points to more than 100% a year. Traders pay the annualized rate for each day they are short. Finally, there is the cost of any dividends paid while the position is open. An amount equal to the dividend will be deducted from a trader’s account whenever a dividend is paid. There is also the risk that a broker will demand immediate repayment of the shares. This is called a “short squeeze” and can happen at any time, in any stock. The trader is then forced to buy the shares at the market price, even if there is a large loss. can be used to benefit from a potential decline. To explain this process, we have an example. To find the most overvalued stock, we used a simple and free screening tool at FinViz.com. We added liquidity filters and the sorted by the P/E ratio, from the highest value to the lowest. The screen is shown below. This screen showed that Eros International Plc (EROS) when we ran the screen. Eros coproduces, acquires, and distributes Indian films in various formats worldwide. The stock is overvalued even after falling sharply from its highs. Because of the stock’s overvalued position, traders should consider using an options strategy known as a bear put spread to benefit from the expected price move. The bearish outlook for EROS, at least for the purposes of this trade, is a short term opinion. To benefit from this outlook, traders can buy put options. Specifically, the December 15 $12.50 put can be bought for about $0.70 and the December 15 $10 put can be sold for about $0.25. This trade will cost about $0.45 to enter, or $45 since each contract covers 100 shares, ignoring the cost of commissions which should be small when using a deep discount broker. In this trade, the maximum loss would be equal to the amount spend to open the trade, or $45. This loss would be experienced if EROS is above $12.50 when the options expire. In that case, both options would expire worthless. For this trade in EROS, the maximum gain is $2.05 ($12.50 – $10 = $2.50; $2.50 – $0.45 = $2.05). This represents $205 per contract since each contract covers 100 shares. That is a potential gain of about 355% on the amount risked in the trade. This trade delivers the maximum gain if EROS closes below $10 on December 15 when the options expire. There is a relatively low probability of that according to the options pricing models. That indicates the gain is likely to be less than the maximum possible gain. 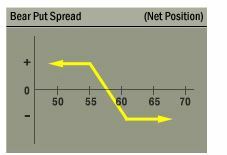 Put spreads can be used to generate high returns on small amounts of capital several times a year, offering larger percentage gains for small investors willing to accept the risks of this strategy. Those risks, in dollar terms, are relatively small, about $45 for this trade in EROS.